Cava Baja is the most famous street in La Latina and is home to a large number of tapas bars and restaurants. From Plaza Mayor, walk down Calle Cuchilleros, cross Calle Segovia and you'll be on Cava Baja. The restaurants and tapas bars on Cava Baja vary greatly in price so check before you go in. Sunday and Monday is when you'll find the least bars open, but there'll always be somewhere to dine. 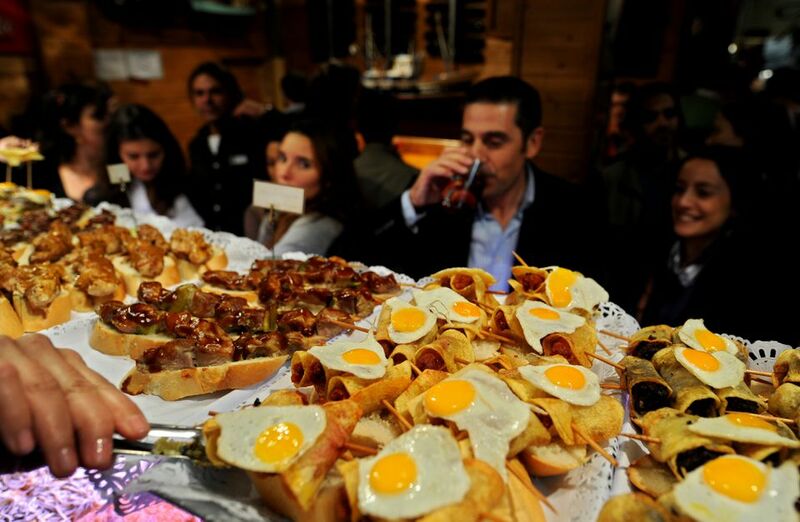 La Chata is one of the most famous tapas bars on Cava Baja. Madrid Discount Cards Get free entry to most of Madrid's museums with a discount card - but which one? A famous flamenco venue in La Latina. Rather than a formal (and often expensive) flamenco 'show', La Solea is where you'll find impromptu shows every night (if one can say such a thing). The guitarist is paid to sit and wait for a flamenco singer to come and perform with him, which one usually will. The two rooms are decorated with traditional Andalusian tiles. Arrive late - at least after midnight. At weekends there'll be great stuff going on after 3am if you are still up that late! Don't expect to see dancing. A spontaneous fit of stomping and arm waving might break out, but it's rare. Go to the touristy shows if that's what you want to see. What is Plaza and Iglesia de San Andres? Take a coffee or a beer in the vibrant square in the shadow of this impressive church. Perfect place for a drink as the sun goes down. Where is Plaza and Iglesia de San Andres? At the south-west end of Cava Baja, at the top of Carrera de San Francisco. What is Basilica de San Francisco El Grande? A large 18th-century neo-classical basilica in the La Latina quarter of Madrid. Where is Basilica de San Francisco El Grande? From Plaza San Andres in La Latina, look down Carrera de San Francisco. The big church at the bottom of the road is the Basilica de San Francisco. The frescoes and other artwork inside the basilica, including one by Goya, are worth going inside for. Open from 11am until 6.30pm (7.30pm in summer), closed for siesta (12.30am to 4pm in winter and 5pm in summer). Casa Granada is the best hidden bar in Madrid. Even when people are told the exact location they still can't find it. Unfortunately, the excellent drink + tapa offers have disappeared as the bar tries to milk its location for all its worth. But it's still a great location for a drink. At C/ Doctor Cortezo 17. Walking down the road between the Teatro Häagen-Dazs Calderón and the movie theater (which also happens to show movies in English), you'll see this buzzer (above) on the left-hand side. Press it and you'll hear a bell. Go through the door and take the elevator to the top floor. Voila! Excellent beer + tapa deals are listed above the bar - the two beers with the cazuela de pinchos (pork in a spicy sauce) is excellent value and tasty to boot. Once one of the most important plazas in Madrid, the sloping Plaza Paja, with it's brace of vegetarian restaurants and nice cafes is a nice spot to stop for coffee or meat-free meal. Just north of the Iglesia de San Andres. The Rastro is La Latina's famous outdoor market, taking place every Sunday. The main street of the Rastro is Calle de la Ribera de Curtidores, though many of the streets in the neighborhood will have things for sale. The Rastro's reputation has far outlived its quality. Lazy travel writers list it as one of the key things to do in La Latina, because everyone else says it too. In reality, it is a far cry from its heyday, with the idiosyncratic stalls of yesterday having given way to pretty standard market fare of band t-shirts and knock-off jeans. But the Rastro is more than just about the shopping. The bars and cafes in the area are particularly lively after the Rastro has drawn to a close, so stop for a drink and a bite to eat before you leave. Calle Segovia is the main street that separates La Latina from Madrid de las Austrias. Starting at the lively Plaza de la Puerta Cerrada (which is packed with restaurants and cafes), the street descends through Madrid, under the famous viaduct. Stop at one of the cafes or restaurants along the way, climb the viaduct for some great views or veer off into one of the parks when you reach the end of the street. Walking down from Plaza Mayor to Cava Baja, you'll cross Calle Segovia. Alternatively, walk south from the royal palace and you'll cross the viaduct. What is Paella at El Arrozal? Simply the best paella restaurant I have had the good fortune to experience. Where is Paella at El Arrozal? Metro: La Latina or Opera. Take the set menu for a good value meal of paella, salad and tapas. Despite its reputation as a 'sea food dish', the original paella is the meat and vegetables version. Order the paella Valenciana to sample this one. What is San Isidro Museum? The San Isidro Museum or "Museum of Origins" is one of a couple of museums Madrid has about its history. From the city's Muslim origins to present day, the San Isidro Museum shows the city's development through its archeological remains. San Isidro is the patron saint of Madrid. Where is San Isidro Museum? On Calle de San Andrés. Open Tuesday to Friday 9.30am to 8pm; Saturday and Sunday 10am to 2pm; closed on Monday.